Well, this book puts me in a not-before-experienced situation. What if I just hated a book not because it was badly written or horrifically racist or dumb, but just because every single thing about the stupid book grated on my very last nerve? 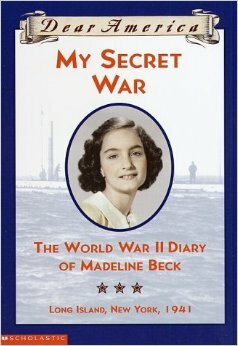 My Secret War: The World War Two Diary of Madeline Beck, Long Island, New York, 1941, Mary Pope Osborne, 2009. I will fully admit that this book is not bad. It is not bad in any way! For whatever reason, I find it infinitely annoying, and part of that is probably because the protagonist is too realistic. She’s a very realistic 13-year-old girl, and there’s a reason 13-year-old girls aren’t the centre of many non-YA novels—they can be irritating as hell. I can say that because I used to be one. This is a Royal Diaries book I’m reading for the very first time while reviewing, and I’m not sure how I missed it on its first publication. 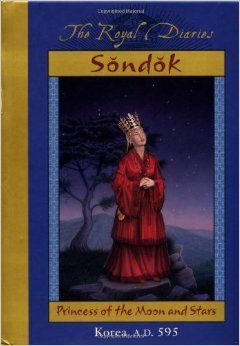 Sondok, Princess of the Moon and Stars: Korea, A.D. 595, Sheri Holman, 2002. To start with, I have to freely admit that my knowledge of Korean history is sadly, embarrassingly lacking. I had to do a quick Wikipedia visit to familiarize myself with the actual historical Sondok (also transliterated Seondeok), a reigning queen of Silla, which was one of the Three Kingdoms of Korea. Silla lasted for 992 years, and I would venture a guess that the amount of time spent on it in an average history class is about zero minutes. I have two degrees in history and I had not heard of Silla before reading this book. Now that we’ve talked about how my lack of knowledge probably contributed to why I didn’t read this book in the first place, let’s get started. Sondok doesn’t keep a journal, per se, but writes on parchment that goes into the Ancestor Jar of her recently-deceased grandmother. She already knows at this point, as a teenager, that her father intends to make her his heir since he has no male sons, and is desperate to make herself worthy of his decision. She loves stargazing and astronomy, but this is considered a male science in Silla, and not something she should concern herself with—which is upsetting to her, understandably so. Barry Denenberg Redemption Arc, Part 1. Probably Part 1 of 1, but we’ll see. This is a step in the right direction. 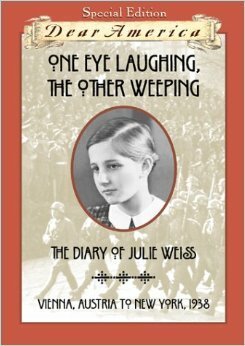 One Eye Laughing, The Other Weeping: The Diary of Julie Weiss, Vienna, Austria, to New York, 1938, Barry Denenberg, 1938. This is flat-out one of the most depressing DA books out there. It’s actually significantly more depressing than a book about slavery, and how awful is that? It’s far, far more depressing than the Titanic book where hundreds of people dying is the main plot! Julie Weiss is a wealthy girl growing up in Austria with her family, where her father is a respected physician, her mother a renowned beauty, and her older brother a snotty intellectual college student. She likes to play cards with the family’s maid, Milli, and annoy her brother Max, and spend time with her best friend Sophy, and avoid practicing the piano, and so on. Her family is very, very well-off, and live in a large and fancy apartment in the centre of Vienna, complete with a dining room that seats twenty, priceless paintings, and so on. I don’t know what to say about this other than, dear God, don’t read it, and don’t pay the twelve cents I paid for it, either. Washington Avalanche 1910, Cameron Dokey, 2000. Fine. I’ll say something else. Dear God, don’t read it. This is one of those abysmal books that tried (in vain) to interest youth in an exciting historical occurrence (namely, the titular avalanche in 1910). But unfortunately while Dear America/Canada did this tolerably well (most of the time), this fails egregiously on a number of levels. It can’t decide whether it wants to be a romance, a history teacher, or an intrigue/thriller, and it is terrible at each one. Also, the main characters are deeply awful people, and not in a “Wow, what an interesting and flawed protagonist!” type way, but a “Why am I supposed to like these people and their problems?” type way.